The Law of Four, or the "Law of 3 + 1"
As I have explained elsewhere, the Camoin 3x7 Diagram allows us to rediscover the secret Codes which were unknown by the Tarot experts. I have notably discovered in the diagram what I named the "Law of the Columns" which are an integral part of the Camoin Laws of Tarot. This law is applicable to other Camoin Tarot diagrams and is used in the Camoin Method of Tarot Reading. For example, in the Camoin 3x7 Diagram, there are seven columns. In each column, there are three cards, and in these three cards there is a common symbolism. This symbolism can be shown by a symbol which appears in the card, a code, a legend, or a concept. 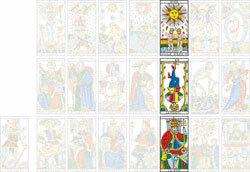 You can find a marvelous example of this Law of the Columns in the article "Jacob’s Ladder in the Tarot de Marseille".